Fortnite is getting a Nintendo Switch bundle soon. On Oct. 5, another Nintendo Switch bundle highlighting unique things from the game will be available in stores at a retail cost of $299.99. The Nintendo Switch: Fortnite - Double Helix Bundle incorporates the system, game download, and some uncommon things for use in the game. 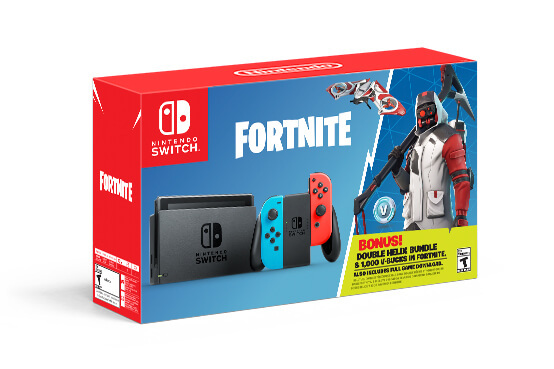 The Nintendo Switch: Fortnite - Double Helix Bundle includes a Nintendo Switch system, 1,000 V-bucks (in-game Fortnite currency) and the Double Helix Set – consisting of a unique Character Outfit, Back Bling, Glider and Pickaxe. The included V-Bucks can be used to purchase a Battle Pass, which unlocks additional in-game content for the free-to-play game, or can be used to purchase other in-game items. "Fortnite’s launch went extremely well — we had more than two million downloads in less than 24 hours," Reggie Fils-Aime, President and Chief Operating Officer of Nintendo of America, told Polygon in an interview at E3 2018. "I think that speaks to the power of the franchise, the engagement of our players and the resonance of being able to play it anytime, anywhere."